Jeanne Antoinette Poisson, who later in life became known as Marquise de Pompadour or Madame de Pompadour, was the official chief mistress of King Louis XV from March 1745 until her death in April 15, 1764. It was rumored that Madame de Pompadour influenced the negotiations between Austria and France, which eventually resulted to the signing of the Treaty of Versailles in 1756. Jeanne Antoinette Poisson was also widely known in France for her exquisite talent for the arts, particularly with paintings and Rococo interiors. She was also one of the most celebrated people in the fashion world. Jeanne Antoinette was a commoner and was born to Francois Poisson and Madeleine de La Motte on December 29, 1721 in Paris. During her childhood, she was nicknamed by her mother “Reinette”, which literally means “to reign over the heart of the King”. Reinette’s early education was spent in the Ursuline Convent in Poissy. While she was there, she studied various skills like singing, dancing and acting. Eventually, Reinette stopped attending the Ursuline Convent and spent time home-schooling instead. She polished her skills and became extremely intelligent and talented. Jeanne Antoinette Poisson was married at the age of 19 to Charles-Guillaume Le Normant d’Étiolles. The marriage was an agreement wherein financial assets and incentives were involved. Jeanne Antoinette eventually gave birth to two children. The first child died because it was stillborn, while the other was named Alexandrine-Jeanne. As a fashionable figure, Jeanne eventually opened up her own salon at Etiolles. Jeanne Antoinette was famous for her exquisite taste for fashion even before she met the King. The King soon heard of her fame and invited her to a masked ball in 1745. A few weeks after the said ball, Jeanne Antoinette became the King’s mistress. The official separation between Jeanne Antoinette and Charles-Guillaume followed a couple of months later. In June 24, 1745, Jeanne Antoinette was given the title “Marquise of Pompadour” along with the estate’s title and coat-of-arms. Her formal court introduction was made on the 14th of September. Although Jeanne Antoinette was adored by the King, many of the courtiers remained hostile towards her mainly because she was a commoner. However, she had influence over political negotiations, like the Treaty of Versailles, the Diplomatic Revolution and the promotion of her favored officials, just to name a few. Since Madame de Pompadour had an eye for paintings and Rococo architecture, she was very eager in promoting the arts. This led to various accomplishments as a courtier. For instance, she established the Manufacture Nationale de Sèvres, which eventually became known as one of the most famous porcelain manufacturers in Europe. It was also told that the Madame herself conceptualized the building designs of Palace de la Concorde and the Petit Trianon with the help of Marquis de Marigny, her brother. On April 15, 1764 and at the age 42, Madame de Pompadour died from tuberculosis. The National Gallery: The Real Madame de Pompadour – A short biography of Jeanne Antoinette Poisson. King’s College: Madame de Pompadour – Detailed article about Madame de Pompadour’s life. Portrait of Marquise de Pompadour – Talks about a particular painting of Jeanne Antoinette Poisson and discusses how the marquis is considered the most read woman of her time and at the same time, a patroness of the arts. Petit Trianon – A short article on what happened to Petit Trianon during and after Madame de Pompadour’s time. Madame de Pompadour – Another brief biography on Madame de Pompadour. Madame de Pompadour Intrigues at Wallace and National – Discusses how Madame Pompadour manipulated her ‘image’ through promoting The Arts. 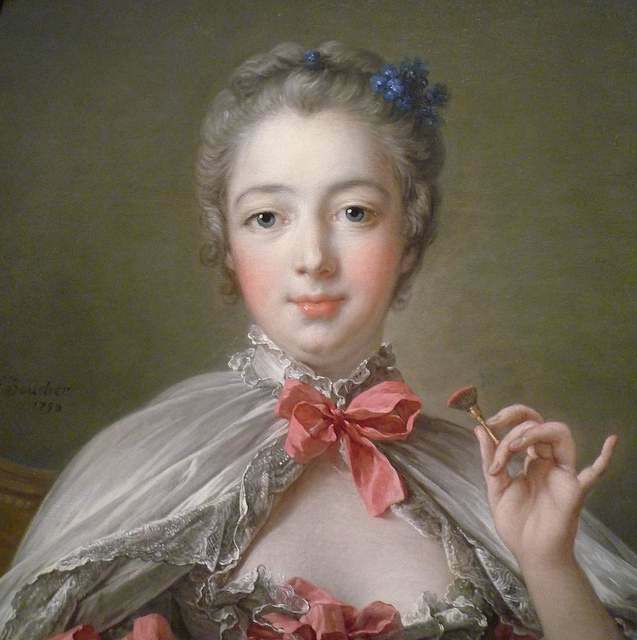 Jeanne Antoinette Poisson’s Birthday – Presents information on how Madame de Pompadour influenced the people of her time and why some objects were named after her. Madame de Pompadour – Louis XV’s mistress – A discussion of the image and political power of Madame Pompadour as a mistress. Madame de Pompadour: Unchangingly Good – Tackles more on Madame Pompadour’s passion for the arts. Women of Influence: Marquise de Pompadour – An entry on the life of Madame de Pompadour. People in Voltaire’s Life: Madame de Pompadour – A brief overview of Madame Pompadour’s life, and how she met Voltaire. Chateau de Versailles: Madame de Pompadour – Talks about how Madame de Pompadour became the king’s favorite and the patroness of the arts. The Splendors of Versailles: Women of Louis XV – Mentions Louis XV’s women including Madame de Pompadour.